Two delicate sterling silver necklaces, one for Mum and one for her daughter. 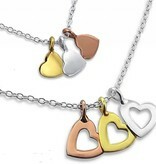 The 3 little hearts in silver, rose gold and gold are symbolic for this loving bond. The card reads: 'The love between a mother and daughter is forever'. The daughter's hearts fit inside mum's. How symbolic is that? 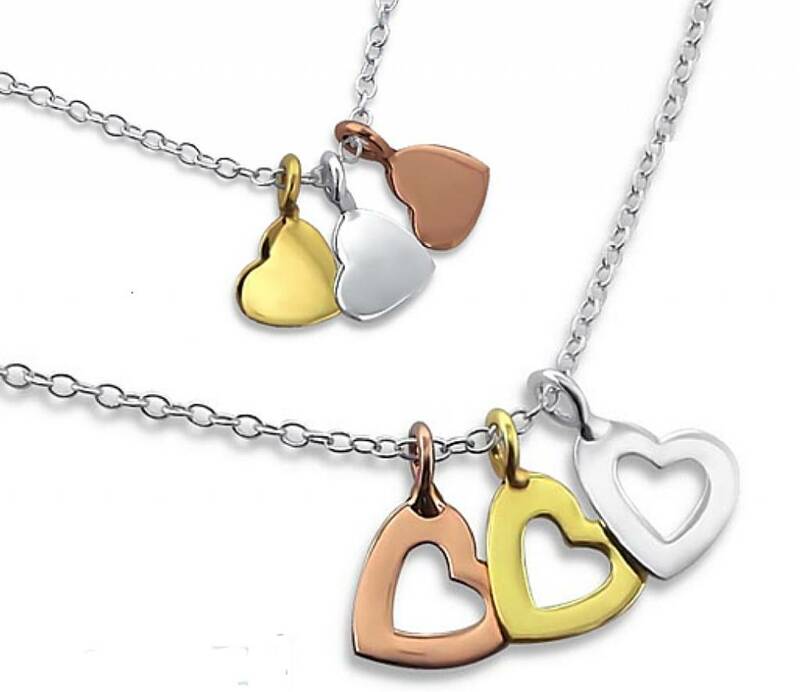 ♥ The necklaces are made of real .925 Sterling Silver and the hearts are solid silver with a layer of rhodium, rose gold- and yellow gold-plated. The rhodium coat gives a warm shine to the colour and enhances the durability. ♥ To celebrate meaningful moments such as a special birthday or anniversary, or just to let her know how much she means to you. ♥ Available in two lengths for girls (35 or 40cm) with a 5cm extension chain, so they can wear the necklace high in the neck or a bit lower. Whatever the occasion. Mum's necklace comes in 40cm with a 5cm silver extension chain. ♥ The 3 coloured open hearts measure 7mm (without the ring) and the little solid hearts measure 6mm (without the ring). ♥ KAYA has specially designed these beautiful lyrics for the 'Jewellery Card' collection. It's a greeting card, jewellery and beautifully presented gift all-in-one. ♥ Order an extra necklace if you have more daughters. Chat with us (bottom right) or email us if you have specific or additional requests. The extra necklace comes with the small closed hearts (for daughters). ♥ You receive these 2 necklaces and 1 card from KAYA nicely wrapped & ready to give. KAYA's 2 necklaces are presented on a beautiful card with a symbolic message and wrapped in a transparent sleeve along with two silver polishing cloths, all in a luxury gift bag.